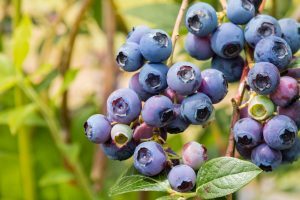 Favorites for Your Edible Garden - Columbia Builders, Inc.
Blueberries can be a delicious addition to your edible garden! Throughout the Mid-Atlantic, all of us – especially those with green thumbs – are thrilled with the springtime temperatures seemingly here to stay! As our thoughts turn to the outdoors, planting a garden is one of the most rewarding activities you can undertake – after all, nothing tastes better than fresh fruits and vegetables you grew yourself! Deciding what to grow is part of the fun, and even homeowners with little prior gardening experience can be successful by choosing fruits and vegetables that require minimal care and maintenance. So what are some of our favorites for your edible garden? Squash is one of the easiest edibles to grow in your garden, making it a great choice for beginning gardeners. There are two types – summer and winter squashes, with the key difference being the amount of time you’ll have to wait to begin harvesting. Begin sowing seeds or setting plants two weeks after the final frost of the season once soil temperatures have reached 70 degrees. Place in full sun, water thoroughly after planting, and keep winter squash types off the ground by using a trellis. Harvest summer varieties in 45-65 days, and pick winter varieties in 60-110 days. Beans are a staple of gardens everywhere and there several varieties available to suit your family’s tastes. Snap beans, or green beans as we commonly refer to them, are ready to pick after 45-80 days – other kinds, such as lima and soybeans, can be picked after 65-100 days. Plant mid to late spring when soil temperatures reach 60 degrees – these plants grow best in loose soil with full sun coverage and regular watering. Blueberry plants are perennials, so you’ll want to find a permanent spot for them in your home garden. Look for a sunny place and start planting throughout the early spring. For best production results throughout the years, strip the plant of all the berries after the first year. These plants are also very easy to care for – your biggest problem will most likely be keeping birds away from the fruits. Water regularly – about one or two inches every week is best. Once the berries are fully blue, you may begin harvesting and enjoying! If you wish to try growing edibles but lack the space, remember that lettuces, herbs, and tomatoes grow well in pots! A container garden on your deck or patio can yield fresh salad greens, tomatoes for eating and sauces, and herbs to season meats and vegetables for weeks. Even better? If your oven features a drying cycle, harvest herbs in the fall, and dry them for use all winter long! This entry was posted on Friday, May 18th, 2018 at 10:27 am. Both comments and pings are currently closed.